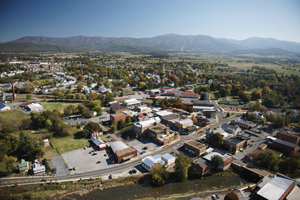 Luray in Page County is located in the Shenandoah Valley region and situated between the Blue Ridge Mountains on the east and the Massanutten Mountains on the West. The Shenandoh River flows northward throughout the length of the county. Visitors marvel at this region, with the George Washington National Forest and the Shenandoah National Park - 60,000 acres - offering opportunities for camping, hiking, horseback riding, fishing, hunting and mountain biking.